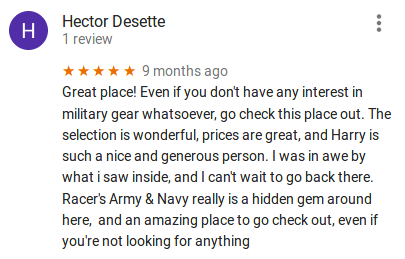 Racer's Army & Navy Store has been in business for more than 22 years, selling both new and surplus military clothing and gear. 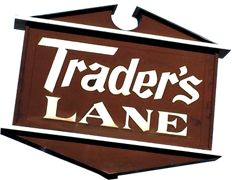 We are conveniently located at Trader's Lane Shopping Center in Williamstown, NJ. Come in and see for yourself, and ask for Harry Racer (Owner)! You can also visit Google photos for more pictures, including 3-D views. 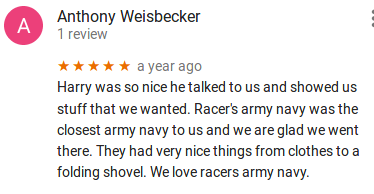 These are just a few of the Google Reviews for Racer's Army & Navy. Our address is 1951 N. Black Horse Pike in Williamstown, NJ. 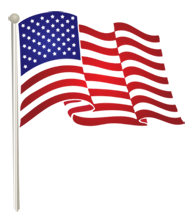 We are located in the Trader's Lane Shopping Center (the former home of the New Jersey Motor Vehicles in Williamstown), right between Integrity Automotive and Rite Aid, and across from BF Landscape Factory.